Meguiar's Leather Cleaner and Conditioner is a quick, one step leather care product that will safely clean and condition your leather and leatherette seats. This product is ideal for anyone who wants that quick and easy one step process that still works well. 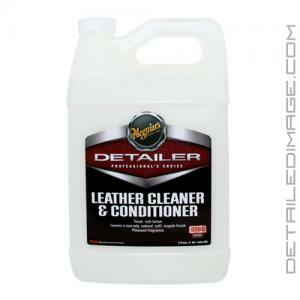 Only one application is needed to clean and condition your leather in a timely manner. The cleaners quickly penetrate the surface releasing contaminants to the surface. The rich coating of conditioners will help keep the seats flexible yet strong. If you desire a less glossy finish, no worries, just wipe it down with a microfiber towel after you apply it. If you are looking for a great value and a one step process to get your leather looking its best then this is the product for you. Meguiar's Leather Cleaner & Conditioner is expressly formulated to enhance the appearance of interior leather and vinyl surfaces. Specialized cleaning and conditioning agents are designed to safely clean and restore leather's original look and suppleness. Directions: NOT FOR USE ON SUEDE. Test small, inconspicuous leather area for colorfastness prior to use. Apply a small amount of Leather Cleaner & Conditioner to a clean, dry, 100% cotton terry cloth towel or foam applicator pad. Work thoroughly into surface. Wipe off excess product using a clean terry cloth towel. Reapply as needed. Professional Tips:For severely soiled areas pre-treat surface with Meguiar's All Purpose Cleaner diluted 10:1. I use this in my shop for not only leather seats, but dashes and door panels also. It can be used on weather seals also to bring back the black color. While it states it is a cleaner, I still use some other product to clean first, then apply this conditioner. I like to leave set for a little while, then wipe down. I have never had a customer complain about it. D180 works very well, we use it here at our shop for every vehicle that has leather. Its a great AIO product that cleans and protects the leather leaving a clean sheen along with a great non greasy soft feel and amazing smell. We buy this stuff by the gallon because its worked great on every vehicle that comes thought here. I would recommend for the best results to steam clean the leather first to remove all heavy body oils and follow up with a 1:10 APC to the leather and then apply D180 using a circle microfiber applicator pad, let D180 sit for 1-2 mins and then remove with a low pile/gsm microfiber towel or a terry cloth. D180 cleans and protects well. I'm happy.